Tuning up to something a little higher than the material world will harmonize you and your surroundings with currents of peace and happiness. MAHA RAS is a mystical combination of African, Indian, Native American, Blues, and Healing Music. The music of MAHA RAS will take you on a heartfelt journey by sharing healing experiences through lyrics and musical compositions. Each song is played with pure love that will uplift your senses. MAHA RAS will take you on a quest to many places in the universe and within yourself. Music is the essence and the basic principle of our life. Music is at the core and the root of our existence. All are welcome to come and enjoy! “This music is a living art form coming out of the heart. 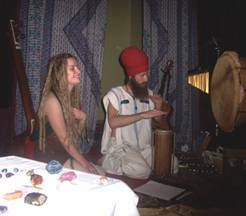 It is music of healing, of peace.” MAHA RAS performs vibrant and healing music on various instruments from around the world including Africa, India, Jamaica, Japan, Europe, Native America, and more. MAHA RAS music cannot be described or defined by any one style or genre. The culturally rich and diverse musical influences of Maha Ras come from deep roots in gospel, devotional bhajans, kirtan, nyahbinghi, reggae, folk, blues, jazz, rock and r&b. This unique music is soulful, touching the innermost through sound, bringing peace of mind and elevation of spirit. MAHA RAS delivers mystic music, a pure organic blend of the modern & the ancient. Experiencing MAHA RAS live is a real eye opener, true upliftment and inspiration to the heart and soul. No drum machines, samples or loops are used. All real instrumentation.